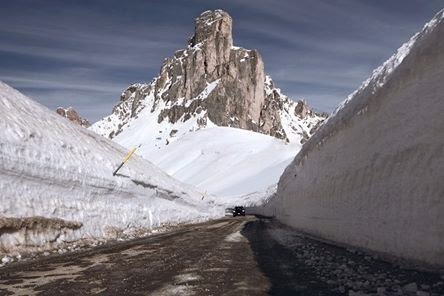 Snapshot of the impressive snow walls along the road to Passo Giau. Search the the little car at the end of the road as size comparison. The southern side of the Alps got enormous amounts of snow this year - whereas there was hardly a considerable snow cover north of the Alps.